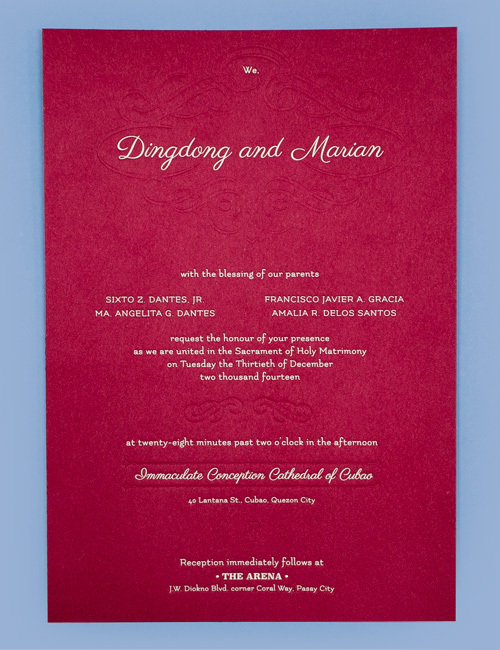 Want To See Dingdong And Marian's Wedding Invitation? Check out all the special details here! 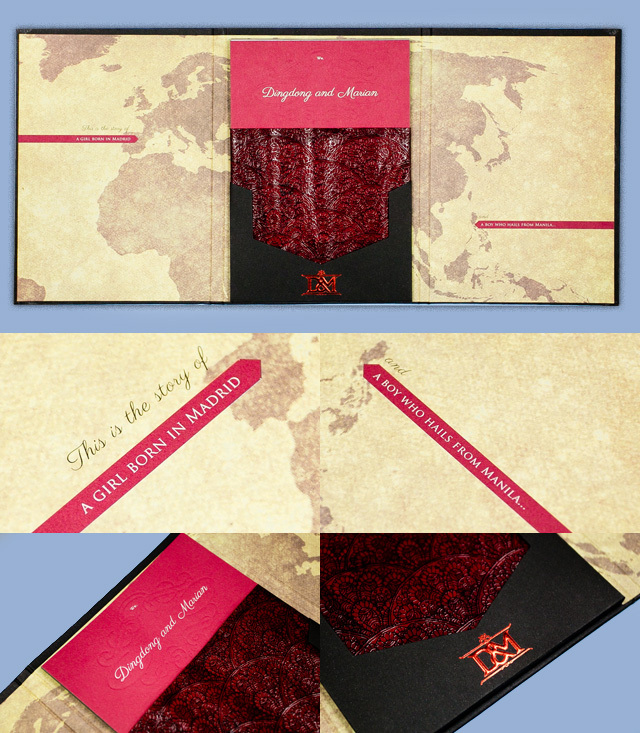 You can just imagine how superduperexcited we were when we got our hands on Dingdong Dantes and Marian Rivera's wedding invitation! 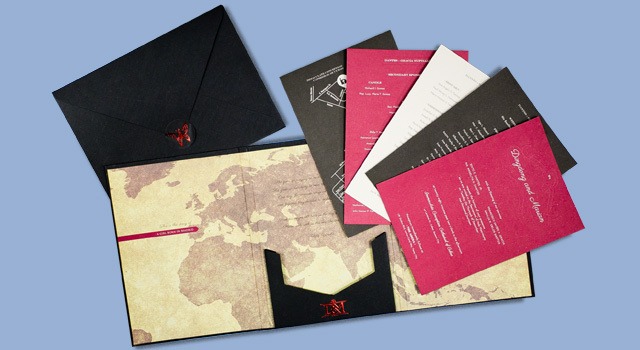 As expected, the "Royally Meant To Be" couple's (we didn't make this up, it's actually their official website) invite was very bongga, from the matte black exterior to the tri-fold cardboard container embossed with a "D" and "M" logo pattern. The left and right flaps have the text, "This is a story of a girl born in Madrid" "and a boy who hails from Manila..."
It's confirmed! The wedding will be held at the Immaculate Conception Cathedral of Cubao on Tuesday, December 30, 2014, at 2:28p.m. Yes—it says, "twenty-eight minutes past two o'clock in the afternoon." We're making an intelligent guess that this is because the couple's favorite number is 8 (WATCH: The Cosmo Couple Challenge), so they incorporated it in their wedding. 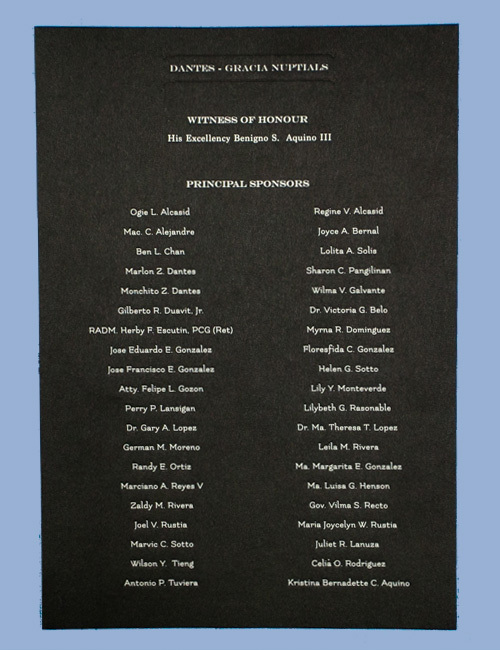 And here's the principal sponsor list. There are 20 pairs (!) with a very special "Witness Of Honor"—no other than President Benigno S. Aquino III himself. 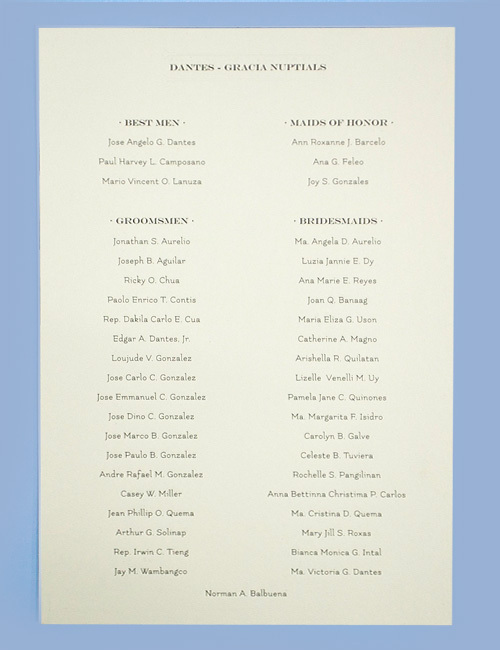 And here are the best men, maids of honor, groomsmen, and bridesmaids—mostly the couple's family members and closest friends. 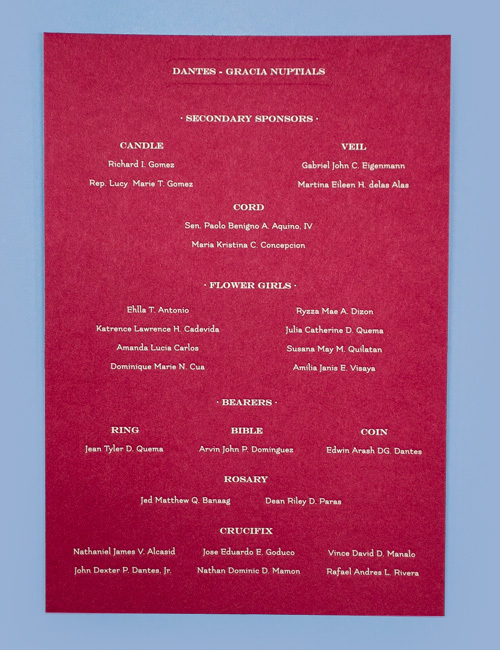 Ooh—check out Bianca Gonzalez's name under bridesmaids! It's now "Bianca Monica G. Intal." ICYMI (but we hope not), Bianca married JC Intal on December 4, 2014. Check out the secondary sponsors! We spy with our little eye: Richard Gomez, Rep. Lucy Torres-Gomez, Ai-Ai Delas Alas, and KC Concepcion, among others. Oh, and it's true—Ryzza Mae Dizon will be a flower girl! We couldn't help but notice how the couple added rosary and crucifix bearers in addition to the traditional ring, bible, and coin bearers; as we all know, Marian is a devout Catholic and carries her Sto. Niño Ball wherever she goes (READ: Unexpected Things In Celebrities' Bags). 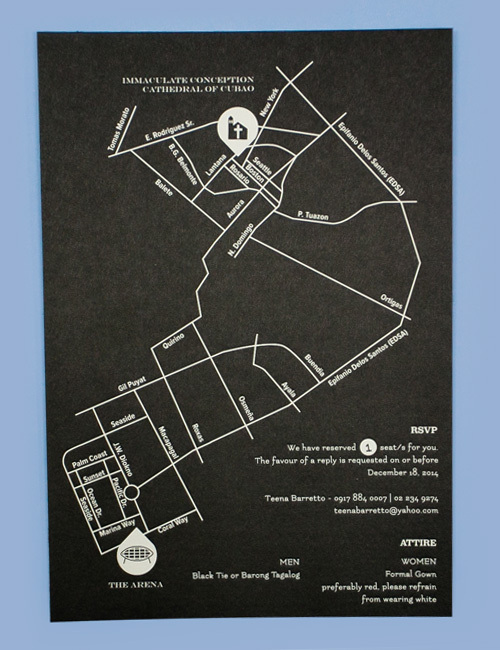 Here's the map to the venue and reception (The Arena). It's Black Tie or Barong Tagalog for guys, and girls are requested to "refrain from wearing white." They are also advised to come in a formal gown, "preferably red." A nice touch: In lieu of gifts, guests are encouraged to donate to YesPinoy.org, a youth-empowering charity founded by Dingdong. What do you think of the invitations, Cosmo girls? Sound off by commenting below! Marian Rivera And Dingdong Dantes: The Cosmo Couple Challenge! 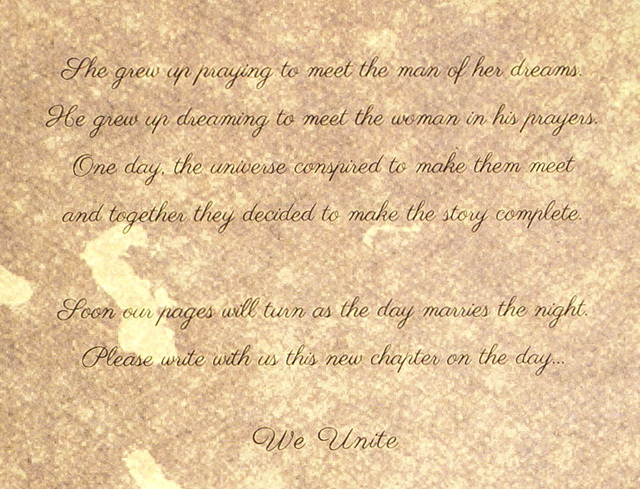 You Have To See Marian And Dingdong's Wedding Website!